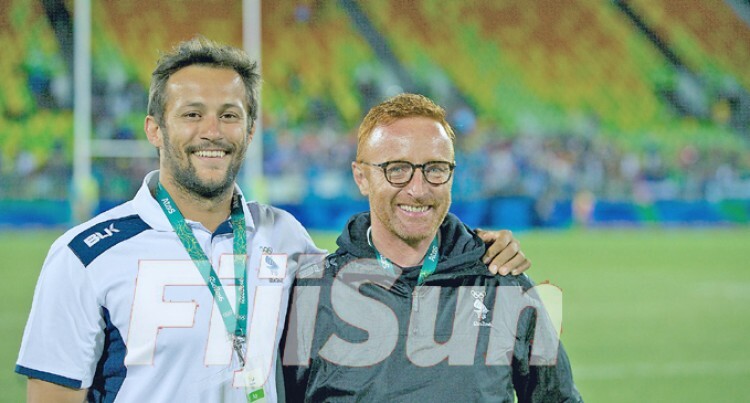 MISSION ACCOMPOLISHED: Team Fiji women’s rugby sevens head coach and men’s skills coach Chris Cracknell, left, and men’s head coach Ben Ryan at Deodoro Stadium in Rio de Janeiro, Brazil. Photo: Bruce Southwick/ZoomFiji. Successful Team Fiji men’s rugby sevens head coach, Ben Ryan is going to take a rest before deciding on what to do next. This he revealed during an interview with Sky Sports in Rio de Janeiro, Brazil, yesterday. “I told them that I was leaving,” Ryan said as his contract with the Fiji Rugby Union expires soon after the Olympic Games. When asked on whether he was going to coach fifteens rugby, Ryan says, he needs time to reflect before making his next move. Looking back, he says, the past three years has been an enjoyable journey. Ryan said when he came in FRU was undergoing a financial crisis and World Rugby had ceased their funding. He indicated that changes began to take place with overseas coaches like him and Chris Cracknell coming in and for the last 24 months everything has gone on very well. “This was due to simple leadership and simple framework,” he added. Ryan also pointed out that for the last two months they have been able to get everything right in their preparation for the Olympics. That’s from their training camp in Uprising Beach Resort, to the Sigatoka sand dunes and then on to Chile before heading to Rio for the Olympic showdown.